Monday December 5th 1921 I went down town in forenoon. Got a chair for Mattie (a birthday present). Mattie was away part of afternoon. I sat by the grate reading. Spent evening visiting with Mattie. Tuesday December 6th 1921 Busy about my own affairs in forenoon. Mattie and I down town in afternoon. The evening up at Bess Stitts. Letter from Hattie. 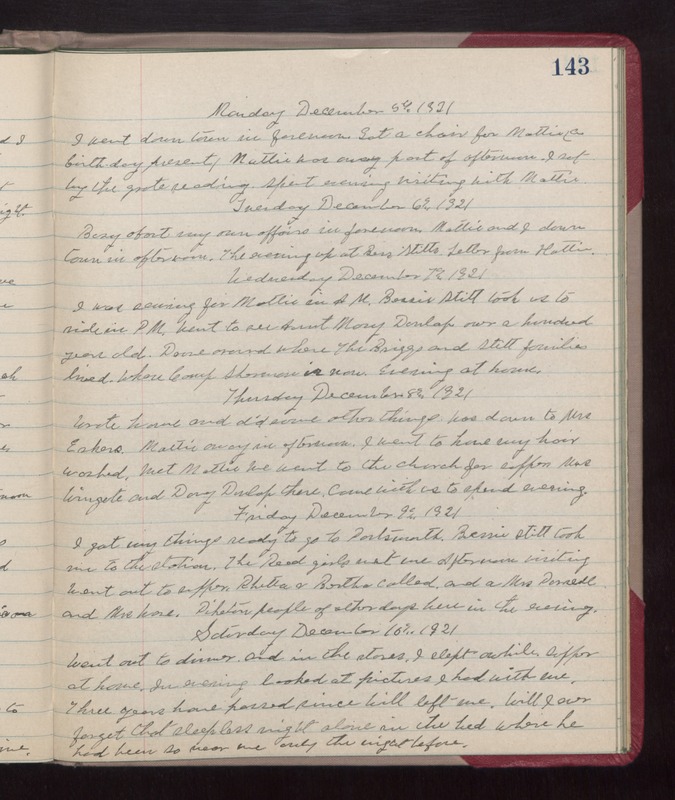 Wednesday December 7th 1921 I was sewing for Mattie in AM. Bessie Stitt took us to ride in PM. Went to see Aunt Mary Dunlap over a hundred years old. Drove around where The Briggs and Stitt families lived. Where Camp Sherman is now. Evening at home. Thursday December 8th 1921 Wrote home and did some other things. Was down to Mrs Eskers. Mattie away in afternoon. I went to have my hair washed. met Mattie. We went to the church for supper. Mrs Wingate and Davy Dunlap there. Came with us to spend evening. Friday December 9th 1921 I got my things ready to go to Portsmouth. Bessie Stitt took me to the station. The Reed girls met me. Afternoon visiting. Went out to supper. Rhetta & Bertha called and a Mrs Purcell and Mrs Ware. Piketon people of other day here in the evening. Saturday December 10th 1921 Went out to dinner and in the stores. I slept awhile. Supper at home. In evening looked at pictures I had with me. Three years have passed since Will left me. Will I ever forget that sleepless night alone in the bed where he had been so near me only the night before.